The extinction of the biggest shark known to science may have triggered whales to grow to their current hefty sizes, a study suggests. 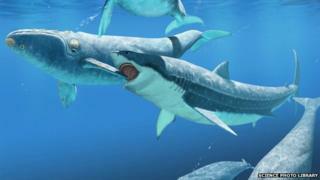 Megalodon, an ancient 14-18m-long predator that resembled a super-sized Great White, may have preyed on primitive baleen whales. These whales were typically smaller than their counterparts today. In their paper, the researchers produce what they say is the best estimate yet for the date of Megalodon's extinction. This date of 2.6 million years ago falls on the border between the Pliocene and Pleistocene epochs. And it was after this point that baleen whales began to grow to their gigantic sizes. Marine mammals are thought to have constituted an important part of the 50-tonne shark's diet. Though there's no conclusive evidence they fed on baleen whales, their fossils are often found along with Megalodon (Carcharocles megalodon) teeth. If they were on the shark's menu, then the removal of this lorry-sized predator might have allowed them to flourish. The baleen whales filter tiny animals out of the water through comb-like structures in their mouths. The group includes the biggest animal alive today - the blue whale (Balaenoptera musculus), which can grow to more than 30m in length. Co-author Catalina Pimiento, from the Florida Museum of Natural History in Gainesville, US, said this was a first step in ongoing research to understand the disappearance of Megalodon. Regarding the evolution of giant size in whales, she told BBC News: "We are not sure how the mechanisms work. "When we found out when that happened, we noticed it coincided with the pattern mentioned in whales. Now we need to find out if one event - Megalodon's extinction - caused the other - evolution of gigantism in whales." But she added: "From modern sharks, it is known that larger individuals have a broader range of prey size, including larger prey. That means that the larger prey will be predated mostly by larger sharks." Megalodon fossils are widely spread across the world; examples have been found in Europe, Africa and both North and South America. It was a formidable predator: scientists estimate that it could bite down with a force of between 10.8 to 18.2 tonnes. The largest teeth can measure about 17cm (almost 7in). Most Megalodon fossils date from the middle Miocene (15.9-11.6 million years ago) to the Pliocene (5.3-2.6 million years ago). But there had been some unconfirmed reports of fossils from the Pleistocene (2.6 million years ago - 10,000 years ago). Dr Pimiento and her colleague Dr Christopher Clements from the University of Zurich used a mathematical approach called Optimal Linear Estimation (OLE) on 42 of the most recent fossils of the shark. The technique assesses the spacing between the fossil dates and will then give a statistical inference of the date at which the species could be considered extinct. In this case, it placed the point at 2.6 million years ago. It's not exact, not least because there is a margin of error on the dates of the last fossils themselves. But it represents a refinement on previous estimates of the extinction date for this fearsome species. The cause of Megalodon's disappearance, however, remains a mystery.